Oil spill, like the one off Mumbai coast in August, leaves crude oil on shores for years. Scientists have devised a way to expedite biodegradation of oil. They collected soil samples from beaches in Prince William Sound in Alaska that saw one of the worst oil spills, 20 years ago. The samples were treated with phosphorus and nitrogen fertilizer in the presence of oxygen. Oil degraded five times faster. This data was used to devise a treatment that involves applying the fertilizers to breakdown natural organic matter in sea sediment. This increases sediment porosity and allows oxygen in seawater to penetrate the affected zone. Better to stop cursing one’s thunder thighs and start working on the beer belly. Increased abdominal fat raises the risk of heart ailments while fat deposition on the thighs and hips lowers it. Scientists found abdominal fat is caused by fat cells expanding in size. Fat in the lower body is due to higher number of cells. Higher cell size hampers metabolic processes. Insects too believe in self-medication. Monarch butterflies can cure themselves and their offspring using medicinal plants. Researchers found that certain species of milkweed, which the larvae feed on, can reduce the threat of a deadly parasite. They also found that parasite-infected female monarch butterflies prefer to lay eggs on plants that will protect their offspring from illness. This behaviour in butterflies is trans-generational. The study is one of the best evidence to date of insects using medication. Here’s another reason to give up smoking. Neutrophils, immune cells in the body, which defend the lung against bacterial and viral infections can turn inflammatory due to cigarette smoke. In response to cigarette smoke, lung epithelial cells release enzymes that activate neutrophils. The neutrophils then release enzymes that cause inflammation. During infection, the peptidase activity (breaking proteins to smaller parts) of the enzyme LTA4H degrades proline-glycine-proline (PGP) enzyme which recruits neutrophils to fight infection. This enzymatic activity is inhibited by smoke and PGP fails to direct neutrophils to the site of infection, leading to persistent inflammation in the lungs. Fragments of 19 million-year-old viruses have been found in the chromosomes of songbirds like cuckoo. DNA analysis shows these viral remnants are hepadnaviruses, a family of DNA viruses that includes the hepatitis B virus. It raises the possibility that hepatitis B virus, which infects about one-third of the human population, could be millions of years old. This is the first time endogenous hepadnaviruses have been found in organisms. Till now, all endogenous viruses found were retroviruses (having RNA). An endogenous virus deposits its fragments in the genome of an organism, allowing them to be passed over generations. Scientists have found that decline in the sun’s activity does not necessarily mean a cooler Earth. They found when the sun is at the dimmest point of its 11-year activity cycle, it warms the Earth and vice-versa. The study is based on the measurements of solar radiation from X-rays to infrared light between 2004 to 2007. The data showed that the intensity of the ultraviolet light fell by six times, while the amount of visible light increased. But Earth became warmer, not cooler. 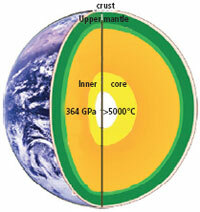 Earth’s inner core is composed mainly of iron. Knowledge of the crystal structure of iron under high pressure and temperature is necessary to understand the seismic structures in the core. It will help predict earthquakes and Earth’s rotation in such conditions. Till date, geologists were unable to reproduce the conditions of the Earth’s core in the laboratory. Now using laser-heated, diamond-anvil cell and synchrotron X-ray diffraction measurements (used for studying mineral behaviour under extreme conditions), they have shown iron crystals at the centre of the Earth align themselves in hexagonal closepacked form, parallel to the Earth’s axis. Two Japanese scientists Ei-ichi Negishi, Akira Suzuki and an American researcher Richard F Heck, were jointly awarded the Nobel Prize in Chemistry for finding new ways to bond carbon atoms together. The process is known as palladiumcatalyzed cross coupling. In the process palladium, a chemical element rich in electrons, acts as a catalyst to couple two carbon atoms from separate compounds. While various methods have been discovered over the years, palladium-catalyzed cross coupling works even under everyday conditions and with precision. The formation of new bonds is a prerequisite for all life on earth. Palladium-catalyzed cross coupling allows chemists to join carbon atoms together, a key step in the process of building complex molecules. It is used worldwide in commercial production of pharmaceuticals, including potential cancer drugs, herbicides and molecules used in the electronics industry. It is used by the electronics industry for coating electronic circuits and for developing thinner computer screens. Russian-born scientists Andre Geim and Konstantin Novoselov shared the Nobel Prize in Physics for their invention of graphene. It is a fabric made from a single sheet of carbon atoms. It is one of the thinnest and strongest material. It outperforms other materials as a conductor of electricity and heat. The duo extracted graphene from a piece of graphite used in pencils. Graphene can revolutionise the way electronics are built, from cell phones to spacecraft. Graphene transistors are predicted to work faster than today’s silicon ones and lead to more efficient computers. Since it is transparent, graphene is suitable for producing touch screens, light panels, and solar cells. When mixed with plastics, it can turn them into conductors of electricity and make them heat resistant. British professor Robert Edwards won the Nobel Prize for Medicine for his work on the technique of in-vitro fertilization. He carried out the research that allows a human ovum to be taken out of the body, fertilised by a sperm, and then implanted into the womb. It is estimated that this treatment of infertility has enabled more than four million babies to be born since it was first started in 1978. Louise Brown became the first test tube baby.